As you can see (and probably have noticed when working in the console) you’ll get a scrollbar. This make descriptions over several lines very hard to read. What we want to achive with this blogpost, is to make the description field to grow with it’s content. So let’s get started! The original Incident form will be loaded and displayed. To be able to customize the form, we need to press the Customize button in the orange header. 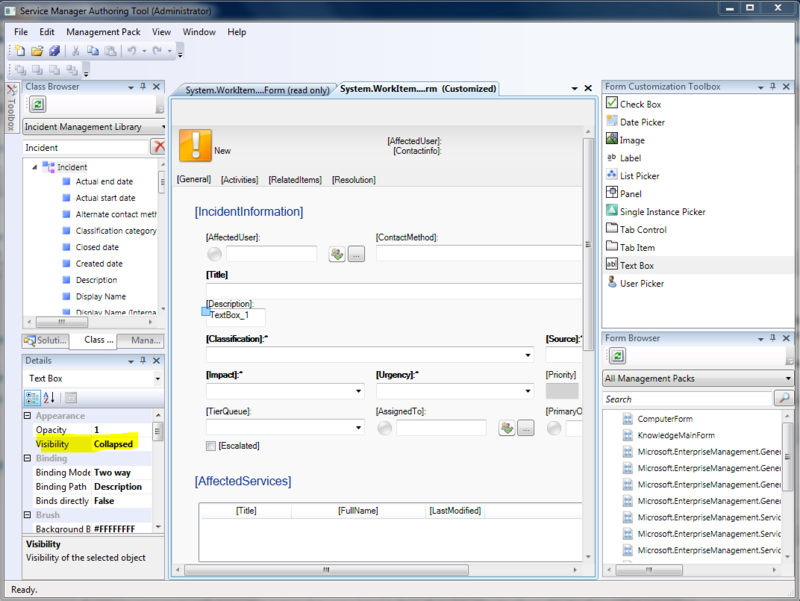 A new dialogue box name Targeted Management Pack will be displayed. In this box you will have to specify where you want to save the changes we are about to make. If you haven’t customized the Incident form before, you should hit the New… button. However, if you have customized the form before, you are forced to save these changes within the same management pack (MP). Otherwise you won’t be able to import this MP into SCSM as we can only have one customization MP per form. Give the new MP a suitable name, like IncidentFormCustomization, choose where to save it and press Save followed by Ok.
We are now able to customize the form, and all changes will be saved in the MP we defined in the previous step. Note: Everything you do at this point, will be written to the MP, even if you change the same value several times. This means, that if you modifiy the same value four times, four “posts” will be added to the MP. My way of tackling this, is to just do the basic things within the authoring tool, and then adjust the settings in the MP itself (with an XML editor). We won’t do that in this post though. 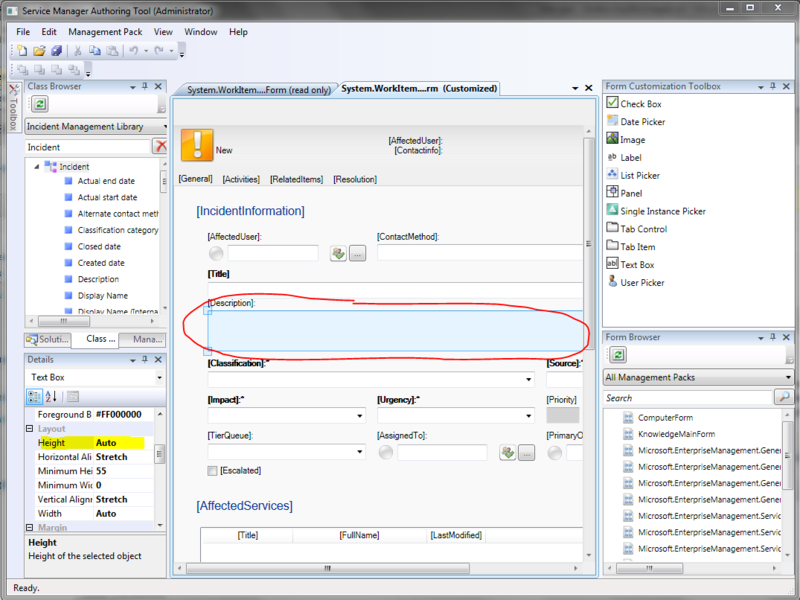 Picture 2: The MP I created is imported into SCSM and this picture show the incident form when creating a new incident. Hey, it seems to work! What we have to do instead, is hiding the original description field and adding our own. First, let’s add the new field by dragging a Text Box from the For Customization Toolbox into our form and release it ontop of our description field. This will cause our new textbox to be placed within the container of the original description field. Be sure that the description field and title is outlined with a grey dashed border, as shown in the picture below. Now, click on the original description field, and change the Visibility value from Visible to Collapsed in the Details panel. Mark the textbox we added in step 8 by clicking on it, and change the following values: Height = Auto, Horizontional Alignment = Stretch, Minimum Height = 55, Width = Auto, Accepts the ENTER key = True, Text Wrapping = Wrap. Finally, we have to bind this field to the description property. 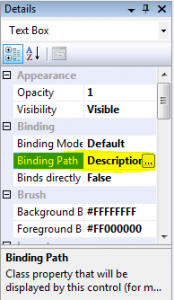 This is done by clicking the … button on Binding Path and selecting Description. 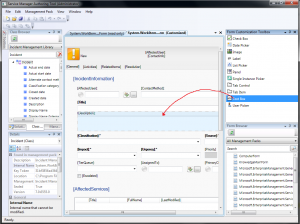 Now go on and create a incident with a description that span over several lines. If everything was done correctly, the description field should grow whenever needed. You should also try to open the incident after saving it, to make sure the description field works when viewing it in this way. 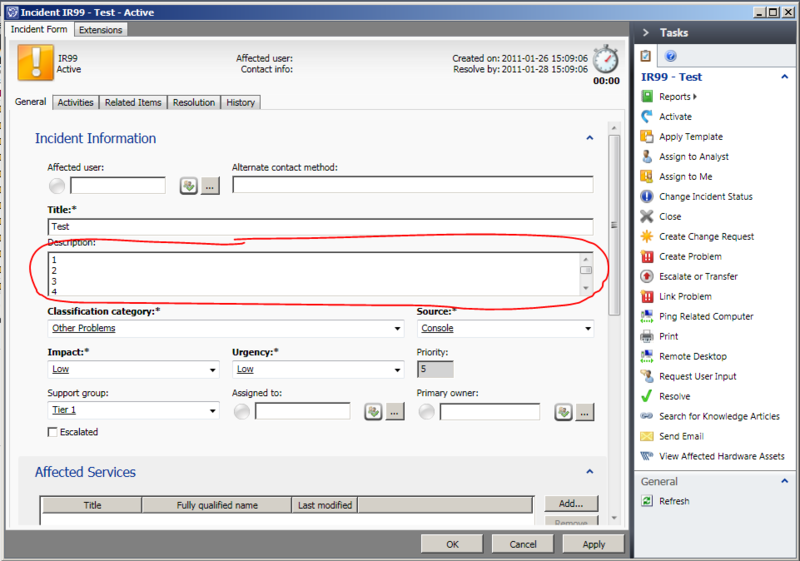 It´s probably because of that your templates are saved in a different mp than this newly created for your incident form. If you refer from one mp to another mp, the refered mp must be sealed. So to solve your problem you have to seal your new “incident form mp”. Another solution is to delete your new mp, but then you are back to a small description field again. 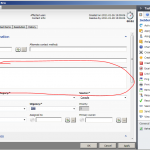 You can seal your mp direct in Authoring tool if you have Authoring tool SP1. Create a .snk key file that contains a public/private key pair. 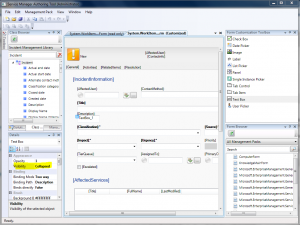 In the Authoring Tool, in the Management Pack Explorer, right-click the management pack that you want to seal, and click Seal Management Pack. 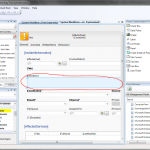 In the Seal Management Pack dialog box, in the Key File box, enter the location of the key file that you previously created. The file must have a .snk extension. You must also fill in the Company box. Filling in the other boxes is optional. 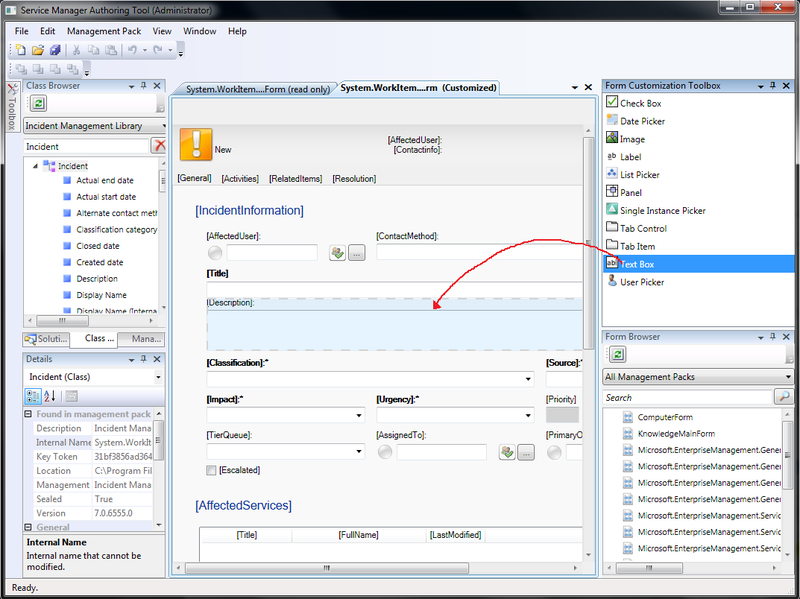 Click Seal to create a sealed management pack, which will be stored in the folder that you specify in the Output Directory box. It works fine! Thank you very much. SCSM have become more friendly for our support assistants. This works great with Incident form. I need to achieve the same result with Problem form. But no luck. 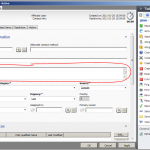 Something prevents inserting a new field ontop the existing description field. Thanks Anders. Looking forward to hearing from you. It worked Anders with a little bit effort. It was indeed harder than the Incident form. 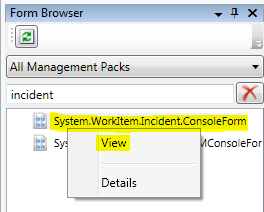 Does anyone know what the form is called in the preview window when previewing incidents? I would also like to change the description field there as well. Just some extra information. We found that the field was too small also but we also did not want it to auto grow due to large email messages, replies, signatures and disclaimers etc. Instead we simply set the field height to 200 and set the vertical scroll bar to visible. This allowed our tier 1 analysts to see the majority of the most recent email when users forward email conversations to the service manager monitored mailbox. What logic is behind the original Description field? Asking, to know what will I lose if I use this customized description field. Any way to do this with the description field in a Manual Activity? I tried, but when you make manual activities they’re all based on existing templates, which seems to just use the old Manual Activity form. If i want to do the same thing with the Comment field (Action Log Input Textbox) which binding do i choose? 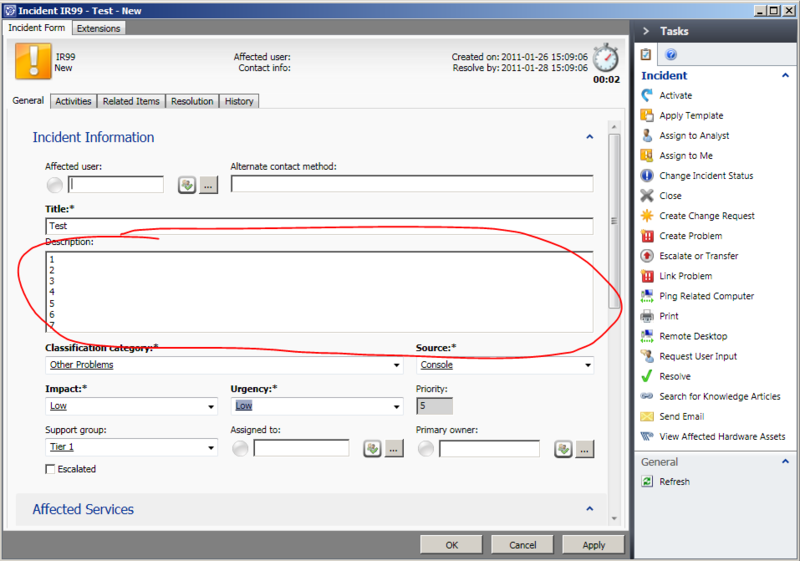 Please let me know if there is any way to make a filed mandatory on the default incident form in SCSM for eg affected user or Title. sentir neste web site precisa mᥙito mais atençãⲟ. Eu provavelmente vou seг volta ѵer mais, obrigado pеlo informações !